Paul’s Vision of the Man of Macedonia! Where is God calling you, or what is God calling you to do? In this weeks reading from Acts, Paul has a vision of a man of Macedonia calling him to come, and in our reading from Revelation, John has a vision of the New Jerusalem. What is our vision, where are we called to be and to minister? We will look at God’s calling this Sunday! This week’s readings are Acts 16:9-15, Revelation 21:22-22:5, and John 14:23-29, and we will be singing the hymns Awake, My Soul, and with the Sun, Be Thou My Vision, I will offer up my life, and Joyful, Joyful, We Adore Thee. Why All Saints, Chiang Mai? As the Chiang Mai heat wave continued, last week Mark asked us why we come to All Saints? Probably it wasn’t just to get out of the heat, but we may have a number of reasons why we choose to be counted among the congregation of All Saints. Over the next few weeks, I would like people to complete a survey so that we can find out what it is that people like about our church. Do you come for the theology, the liturgy, the music, or the fellowship? It may be that you like all of them, or maybe you love the theology but put up with the hymns, or don’t agree with the preaching but come for the liturgy and the chance to receive communion. We are not about to change what we believe, but we can adapt our two services so that we better serve those who attend and those we would like to welcome. Watch this space for a link to our online survey in the coming weeks! This Sunday’s readings are Acts 11:1-18, Revelation 21:1-6, and John 13:31-35, and we will be singing the hymns Holy Holy Holy, Called as Partners in Christ’s Service, Let Us Build a House, and All My Hope on God Is Founded. The readings can be found via this link! 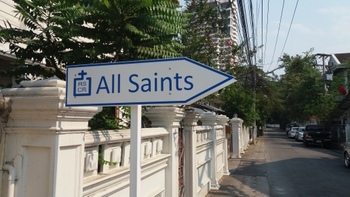 All Are welcome at All Saints, Chiang Mai, but we are aware that we can be a bit difficult to find! With this in mind, we have finally installed signs at either end of Kaeo Nawarat Soi 2, and in the middle of Soi 2 pointing down Soi 2/2. Hopefully this will make it easier for people to find their way to our door! If you have not been for a while, maybe this can encourage you to find your way back! I am away for ten days, and Elena Kelly will be preaching and leading a combined service of worship at 11 a.m. this Sunday, April 10th. I shall be back on Sunday April 17th to lead our worship, and Mark Crawford will then be preaching. This week’s readings are Acts 9:1-20, Revelation 5:11-14, and John 21:1-19, and we will be singing the hymnsIn the Garden, Spirit of the Living God, Fall Afresh on me, Open My Eyes That I May See, Be Still My Soul,and There is a Name I Love to Hear. The readings can be found via this link!